Finally, the merge… And once again, what an episode, and especially what a tribal council! She blew it. Amanda finally took action. Amanda finally stopped being a follower for a second and even succeeded in manipulating Parvati and making her believe they were rekindling their old alliance from Micronesia, and Parvati even told her she had an idol. That was the info and the wedge the Heroes needed to figure out what’s really going on with the Villains. But she blew it. Not only Parvati having an idol didn’t ring a bell about the fact that the story that Russell told was a complete lie, but on top of it she had to overdo the whole “Play your idol Parvati because we’re voting against you thing” and Parvati knowing Amanda very well, it didn’t take her long to figure out she was not going to be targeted at tribal, so she could hatch a crazy plan. Not much about Candice today. And actually I feel that this is important. At this point of the game, Candice is in a somewhat OK position as nobody seems to be targeting her anytime soon. If she doesn’t do anything stupid or if nothing crazy happens (and this being being the way it is, wa can expect a few more crazy things happening before the end) Candice could easily make to the final four, or even further. But I said “if she doesn’t do anything stupid” which she started doing at the immunity challenge. She obviously seemed to be on the way of winning it, so why did she decided to give up? The only logical explaination I have is that, knowing she was not going to be a target for the next vote, she didn’t want to look threatening for the following one as “the girl that wins immunities.” Come on Candice, not only everybody knows where you stand (and yes, they know you’re a strong woman, but not to the point to be the most threatening player for individual immunities) but not winning that challenge was strategically stupid as you basically gave the immunity to Parvati and Danielle, that was one less target for you guys and one more opportunity for the Villains to be safer. Did he do or say something that mattered this week? I can’t remember. She’s really stepping up these days. She hasn’t really made any enemies, she’s super tight with Parvati, while still pretending to be Russell’s coatail rider, and on top of that, she wins the first individual immunity challenge. And all of this being totally under the radar behind Parvati and Russell. She seems like a lock for the final four too at this point. So is this the stupidest Survivor mistake? I’m not sure. Last week, I thought that it was forgivable because he just couldn’t know. But this week, Rupart warned him, Amanda must have warned him of something, and he did smell something funky when Parvati gave the immunity challenge to Danielle. And still, he went with the original plan, and he totally got burned by it and played by Russell. That’s sad, JT was playing so well at the beginning of the season, but there is such a thing as playing this game too hard. Jerri got lucky, that’s pretty much all I have to say. I wonder what’s gonna happen now. She knows she’s at the bottom of her alliance (well, unless you consider Sandra in her alliance), so she could be likely to flip sides (although that would be stupid at this point, I mean later) but Parvati saved her when she didn’t have to (well, she had to in order to keep the majority, but that’s all) and we all know they don’t like each other. What I’m wondering now is what side will Jerri be on if Parvati and Russell go against each other next week. Oh well, we’ll see. With this episode, Parvati deserves her spot in the “best players of all time” category. The way she’s playing basically everybody is just amazing. And that move at tribal council. Brilliant! Some people will think that it was stupid to play both idols, but I don’t think so, Parvati doesn’t really need idols to go further in the game, and had she played only one, it would most likely have been to save Sandra, which wouldn’t have worked. The only thing I can see as a mistake is alienating Russell this early in the game. She’s starting to know him now and she must know that he won’t react kindly to the fact she hid that idol from him. I’m not sure if she has something up her sleeve. Maybe she expects the Heroes to be mad enough at Russell so that they voted against him alongside herself, Danielle and whoever else, but that means that they’ll be four against four after that. Maybe she expects Amanda to align with her after JT’s and Russell’s ousters. I’m not sure. For once Rupert got it right, not once, but twice: he believed that Sandra was telling the truth, and he understdood that there was something funky with Parvati giving up the challenge. So why did he not act according to that? Here is why, and here is why people like Rupert (and Amanda) will never win Survivor: she can’t make big moves, they always wait for somebody to tell them what to do, and they let JT tell them what to do instead of telling him what to do. 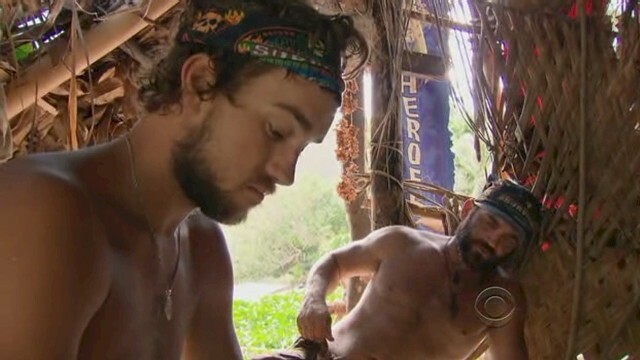 He was brilliant in his manipulation of the Heroes, but what he didn’t realize is that he’s being played more and more by Parvati (well, he realized at when she pulled out the second hidden immunity idol). I’m really wondering what’s going to happen. Is he gonna get really pissed at Parvati to the point of targeting her (with whom? Jerri? Sandra? Obviously not the Heroes) or will Parvati manage to turn him into a puppy again (you know, the kind of puppy that gives his idol to her not once but twice), or will she cut his head off? The latter seems a bit early though. In any case, Russell may start to learn humility now. He deserves to be an All-Star, no doubt about that, but will he be up to playing and surviving a post-merge all-star game? We’ll see. Once again, I don’t understand Sandra. She could be one of the best players ever, on the level of Cirie and other great social players, but she can’t be strategic. Why did she go see Rupert and tell him what’s really going on with the Villains but not jump ship and align herself with them? At that moment, she had no idea that Parvati has one or even two idols, I don’t think she knew until Parvati pulled them out. We must have missed something that was edited out, or I just don’t understand something, but that doesn’t make any sense. Mmmm…. Either the Heroes are done and will be picked one by one, or Russell will be so pissed that we’ll see a duel between him and Parvati that could give some time to the Heroes to regroup and maybe “hire” Sandra or Jerri. In any case, all hell will keep on breaking loose and that will be awesome. Russell ? Parvati ? a Hero ? Who ? I’d say Amanda.